Poker face? I think not! Hey guys! Today I'm gonna talk about an app called Texas Poker by Kamagames. I think the name explains it all right? This app is about playing Texas Poker plain and simple. Right off the bat, I am going to say this app has an AMAZING layout! The app opens into 4 split screens that show you your chats, the available lobbies, the tournaments and the home page. From there, you can navigate easily to play with your friends or the people online. For the gameplay, there is nothing much to talk about. It simulates the experience of playing real life Texas hold'em poker with a table of up to a maximum of 9 people. What's new about this app is the tournament feature! This is what really gets me excited. The app used to be just playing at a table with people coming and going all the time. With this new tournament feature, you can really test your skills to see if you come out tops in the tournament! With the chat system in place in the app, the app almost acts like a social media platform. Being able to add friends to chat and play with them really enhances the gameplay for this app. One downside to this app is that it requires and internet connection to play. There was this time when I had a flush and I was going to win the pot, when my mobile connection decided to go dead on me. Without the connection, I lost the pot. So a piece of advice to all who play poker on this app. Make sure you have a good connection without any disruptions! Another thing I want to mention is that since the app is online and all, you will not need a good poker face to play it! 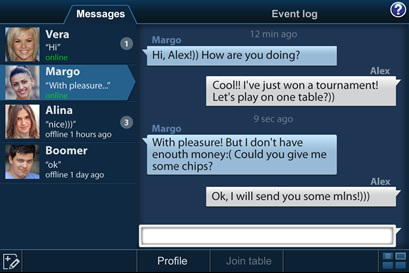 To all the people who find playing poker a chore, you may want to try out the app and see if you can develop an interest in it. This is Dennis "the menace" Lee signing off! Keep on pwning and winning those chips! http://roulette-gamedownload It's good to see this information in your post, i was looking the same but there was not any proper resource.